There was a super- juicy area in this last kiln - no dry spots (YAY) but there was a region that got heavy soda, so much glaze it flowed in rivulets on some pots. As it does when it's fired in reduction, the thick soda glass turned charcoal...wait, no, silver...what's another pretty word for grey? I just mean - in selling these pots, I never describe them as just grey. Dove grey, maybe, or pearl grey. People think they don't like grey. Shopkeepers think people don't like grey. But these pots, with their juicy grey rivers of soda? Are flying out of here. Every time I post one it's gone in an hour. (KNOCKS WOOD, really hard. Nothing to hear, here, jealous gods, move along!) So I only have one left, of the mugs from the super-juicy spot in the super-juicy firing. It has some grey, flecked with gold. Why are these the mugs in huge demand, in a world where bright colors are king? I have some thoughts about this, about how people make aesthetic judgments. There may be some aspect of aesthetics that is hardwired - a preference for bright color would make it easier to find food: fruit, obviously, and edible flowers; and flowers can mark the locations of edible roots, or, later, berries. It must be a pretty mild preference, though, (if it's there are all) because historically plenty of cultures have favored neutrals and muted tones. Most of our aesthetic is formed by what we see every day. And what we see every day is formed by our aesthetic. It's a feedback loop. But there are little cul-de-sacs of preference that form when people spend a lot of time with a less-mainstream aesthetic. The people who bought these magical grey, wonky, fluid mugs? All people who, while not potters, have spent some time looking at and thinking about handmade ceramics. For most people, their ideas of what is beautiful are shaped almost entirely by machine-made objects. Things that are asymmetrical in form or surface, things which have uncontrolled aspects, these look weird or flawed to most people. The same for colors: what is thought of an normal is informed by what we see every day. In Western culture, we favor neutrals for background aspects - walls, floor, window treatments, even furniture - and but we are drawn to brights for more intimate objects - towels, throw pillows, and yes, pottery. We also favor the kind of symmetry that comes from machine work. (I have a world of thoughts about this: how people think they want handmade but the handmade most people like best looks a lot like mass produced ware. )Yes, this is a very broad generalization, and yes, many people fall outside of it. Don't @ me , I know! That's the point: the exceptions. Where do they come from? They come from exposure to things outside the mainstream aesthetic. From you, from us, with our wacky, wonky, handmade pots! Every time you show them or post them or use them with friends, you are changing the world a little bit. You are changing the cultural aesthetic just a titch. I like to think that at the same time we are making the culture a little more accepting of differences, quirks, oddballs. 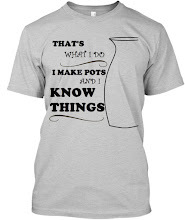 If you can love a pot that is a little off-center, why not a person? If you can love a mug that doesn't fit anyone's mold, maybe you can see as lovable a person who doesn't fit society's mold. It's OK - no, it's beautiful! - for us each to be unique. ANYWAY! Sorta wandered off into the weeds, there (but they are very beautiful weeds!) 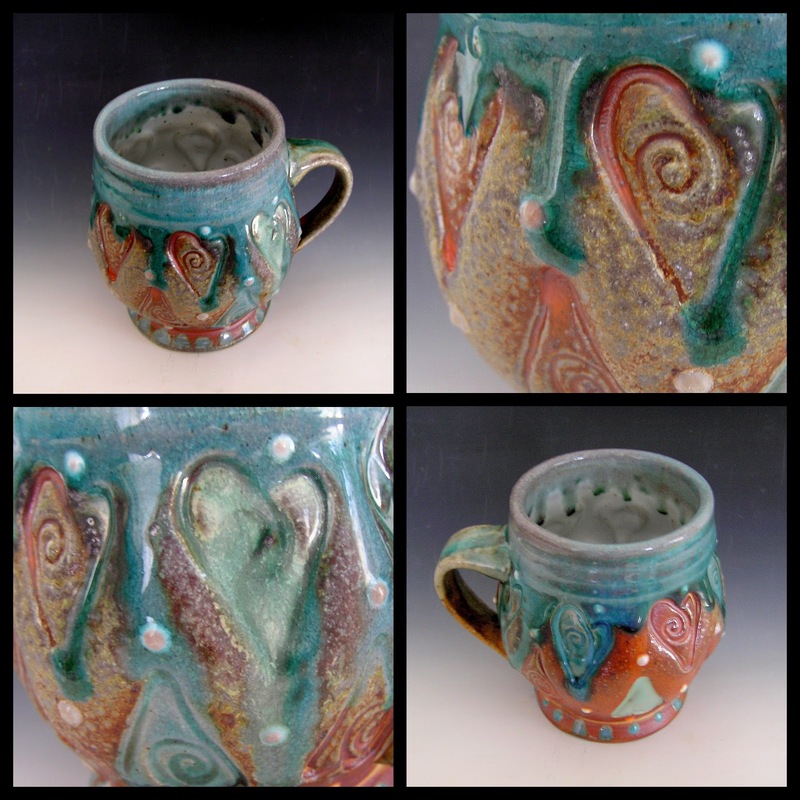 If you want the last super-juicy mug from the super-juicy firing, you can buy it here. Who knows when the kiln will grace me so again? So true ... Love it! DAY-UM, I missed my chance. If/when you get more mugs, bowls or plates like that last juicy one, I need, need, NEED 'em. RILLY and true!!! Who's Afraid of a Little Rain?